Natasha is a 3rd year Biomedical Engineering student. Before joining City, University of London she completed her A Levels in Kenya. My main attraction to City was its prime location. Studying and living in Central London provides for interesting experiences and has given me exposure to different types of people, activities and much more. I’ve enjoyed studying at City and something I noticed is that the University is always carrying out new projects and making small changes to improve the facilities, and I find that really exciting. City offers a variety of clubs and societies, however being a sports lover physical activity is very important to me and helps me take a break from the usual study schedule. I have joined: The City University Hockey team, the Mountaineering club (CUMC), have become the captain of the City University women’s table tennis team and I am an active member of City Sport. 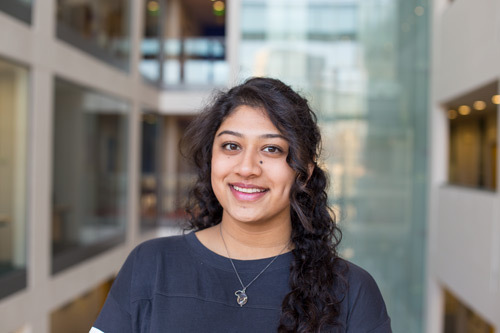 I am also on the communications committee for the Indian Society and have proudly become a Student Ambassador for the Widening Participation team. After graduation, I would prefer to work in an industry related to my course because it is something I enjoy, but will also keep my options open for new opportunities that may arise.